A crown is a dental restoration that covers or “caps” a tooth to restore it to its normal shape, size, and function. Its purpose is to strengthen or improve the appearance of a tooth and protect it from fracture. When the structural integrity of a tooth has been compromised by old filling materials, cracks and/or decay, a crown is the indicated treatment. Before– This patient came to Dr. Jack Hosner’s office in Portage, MI unhappy with her smile. She had severely decayed and broken teeth. 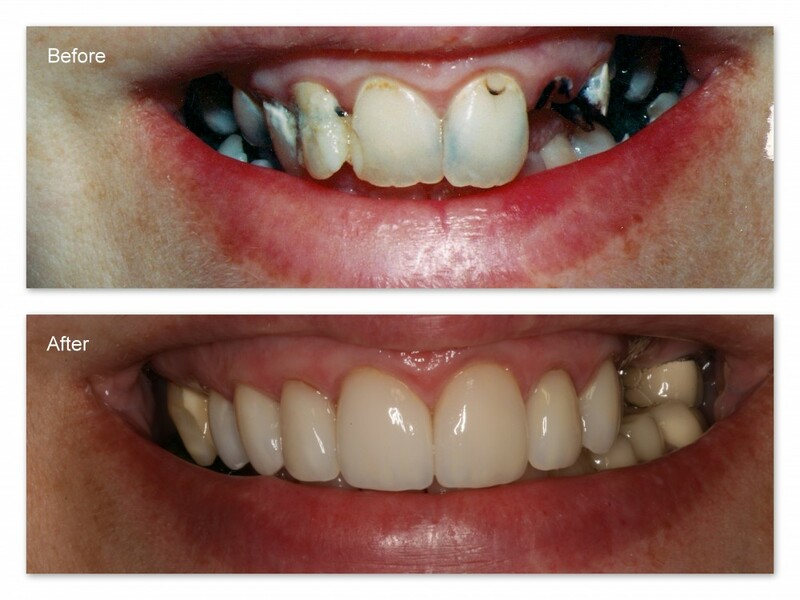 After– This photo shows all the decay removed and seven upper teeth restored with porcelain crowns. No teeth were removed, and further treatment is needed. Before– This patient of Dr. Jack Hosner’s from Portage, MI did not like the crooked and stained appearance of her teeth and she did not want orthodontics (braces). After– Porcelain crowns and veneers were placed to whiten and straighten this patient’s smile. Before– This patient didn’t like the staining or shape of the two front teeth, nor the shape and color of the two teeth to the left. After– Dr. Jack Hosner of Portage, MI placed four porcelain crowns on these teeth to improve color and shape. After– Porcelain crowns were placed by Dr. Jack M. Hosner, DDS of Portage, MI to protect teeth from further erosion and to provide a better smile. Before– This patient of Dr. Jack Hosner’s from Portage, MI did not like the discolored and poorly shaped front porcelain crown. After– The new porcelain crown really improves appearance of smile. Before– Crooked front teeth with large composite tooth colored fillings. One of these teeth also had root canal treatment which further weakened the tooth. After– Dr. Jack Hosner of Portage, MI placed two porcelain crowns on these 2 front teeth to protect them from fracture, and also to straighten and improve esthetics. Before– Old, unattractive PFM crowns on this patient’s upper front 4 teeth. 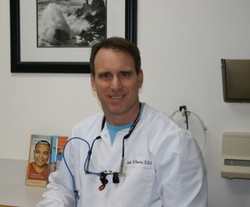 After– Dr. Jack Hosner of Portage, MI placed four new porcelain crowns. Before– This patient has three teeth he wants restored. One has an old porcelain fused to metal crown on it that shows a dark, unsightly line near the gums. The other two are heavily restored with fillings, and the teeth are weak and subject to fracture. After– Dr. Jack Hosner of Portage, MI placed porcelain crowns on these teeth to protect them from fracture and to improve their esthetics. Before– Old and dull composite resin filling on front tooth with poor shape. After– Dr. Jack Hosner of Portage, MI placed one porcelain crown to improve appearance and protect tooth from fracture. Before– This patient broke half of his tooth off. After– Dr. Jack Hosner of Portage, MI restored tooth with a porcelain crown. During– All defective fillings and decay were removed. Notice the thin and fragile natural tooth structure remaining. After– New composite resin fillings were bonded to these teeth and then gold crowns were fabricated and cemented over these teeth by Dr. Jack Hosner of Portage, MI to protect them from fracture.